Best of Breed vs. Integrated ERP | ERP the Right Way! We have all heard the proverb “A chain is only as strong as its weakest link.” Applying this concept to business software, we would conclude that a business solution is only as strong as its weakest integration. 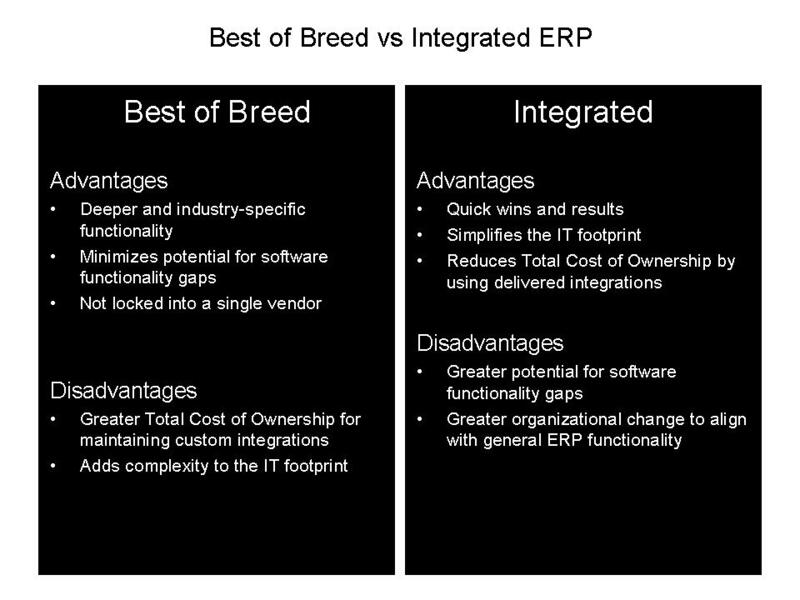 Usually overlooked and underestimated, integration is one of the most important factors to consider as part of a best of breed vs. integrated ERP solution. The benefit of richer functionality is limited by partial integration. 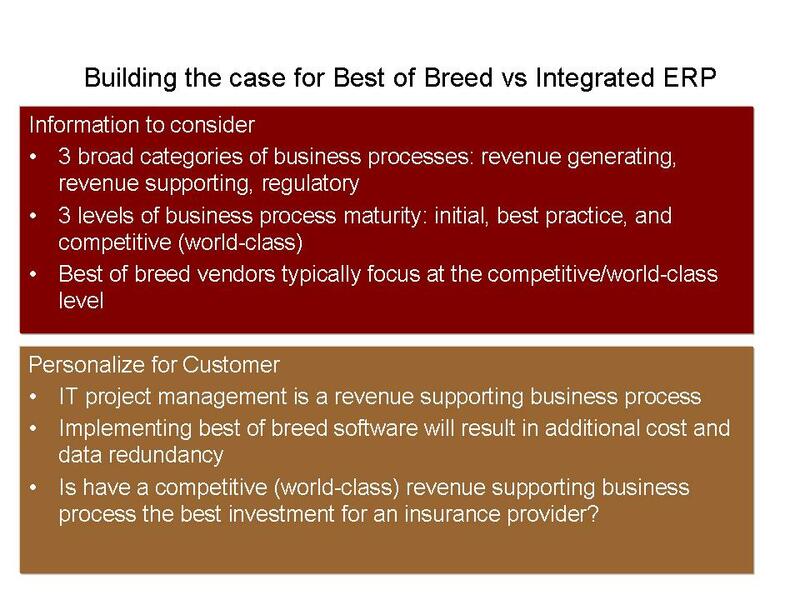 In the next sections, we will discuss all the factors to consider as part of making an informed decision regarding best of breed vs. integrated ERP. 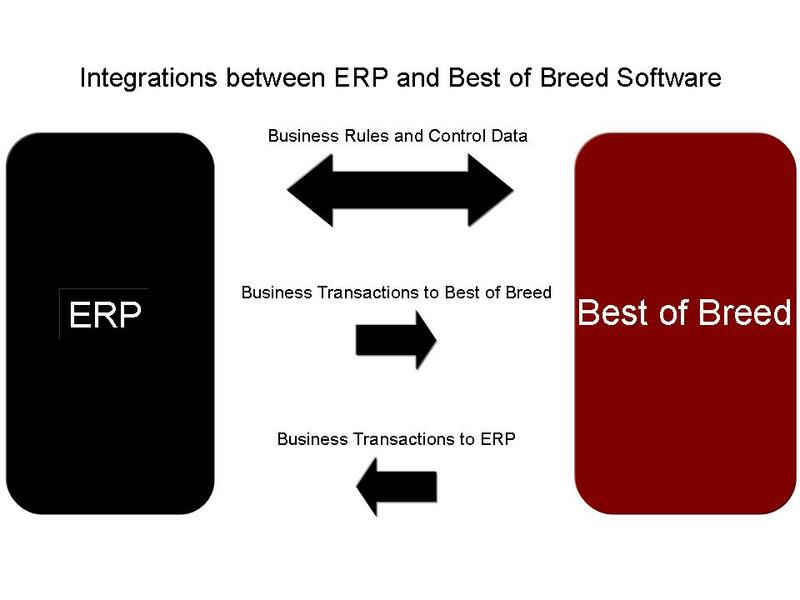 Integrating a best of breed application with ERP software will result in additional cost and maintenance (ex. dual upgrade and maintenance cycle). Developing integration between a best of breed application and ERP software will not be as robust as the delivered ERP integrations between its applications. Part of result has to do with the total integration cost over the life of ERP and the other area is the simple fact that the underlying data models are different. The question I challenge my customers with is “Will having a best of breed software versus integrated ERP worth the cost?” Will the additional investment generate a significant impact to competitive advantage? Ultimately, the business makes the decision but as business technology advisors (IT, Consultants) it is our responsibility to present all the relevant information in the appropriate content so an informed decision can be made. There is one area in particular that is generally not fully elaborated – the true cost of integration. When we think about integration between two different software packages we usually only focus on transactions. To continue with the example I provided in the previous section, following is a representation of the required integrations between ERP and the best of breed packaged software. Each packaged software has business rules and control data (ex. Project types) that govern how software functionality supports business activities. Also, consider that the underlying data models for each packaged software are different. There must be a process (either manual or automatic) in place to keep the respective business rules and control data in sync. Business transactions must also be replicated between the ERP and the Best of Breed packaged software. It is worth considering the amount of data that must be replicated between the two software packages. I understand that replication sounds much worse than integration; however, when we need to integrate transactions between different data models, replication is typically the approach taken. Even when an ERP vendor indicates they have delivered integration with a best of breed packaged software we need to ask whether the integration is services-oriented or data-oriented (replicated). Making the decision to implement a best of breed approach for supporting business activities will increase the total cost of IT as well as put the underlying technical architecture is not flexible and adaptable to meet emerging requirements. Does Best of Breed Make Sense? Let me say this loud and clear “ABSOLUTELY”. 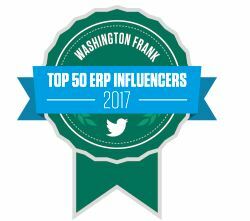 ERP can be a good integrated solution to support revenue-supporting, compliance, and generally accepted best practices. However, ERP does not support competitive practices (if it did then the business practice would no longer be competitive because it is generally available to everyone). Generally speaking, a best of breed software vendor may be more open to active collaboration and co-development with customers in developing solutions for emerging requirements – which is the nature of revenue-generating business processes. Yes, there will be the additional cost and support but the payoff is far more significant in terms of the potential for increased revenue and market share. Business processes, not individual business functions, generate business results. Too often, we only focus on business activities and the specific software functionality that supports these activities without holistically addressing the entire business process. This limited view typically results in a short-sighted decision resulting in a higher Total Cost of Ownership (TCO) and a less flexible software solution. Best of breed software may be the best decision for supporting revenue-generating business processes. There are times were integrated ERP is the right choice given the potential return. What is most important to consider is which choice will enable the customer to be in the best position to take advantage of future opportunities. Pingback: Cloud ERP – New Dog, Same Fleas « ERP the Right Way! 1. Many full suite solutions make compromises in usability based on the need to meet the functionality requirements of a full suite. This very often results in a complex or cumbersome solution for some of the specific areas that would be covered by a best of breed solution. The Best of Breed is optimized for that point functionality and can add prodigious amounts of efficiency to an organization. So it is not always world class competitive advantage that drives the Best of Breed decision. 2. Integrations can certainly add to the TCO. The challenge is to keep them at a level where they meet the basic needs without becoming too complex. Many organizations try to integrate too much functionality and end up with a nightmare. Focus on the basics and the TCO can be manageable, try to build the ultimate integration and the costs and timing can be a problem. 3. A practical rule on integration best practices is to try to keep it at the data layer wherever possible because the more business logic you put into the integration, the more complex and expensive it will be to maintain. I hope this is a useful perspective. Thank you Todd for sharing your knowledge and “hands on” experience. Pingback: The Next Evolution of ERP: Adaptive ERP « ERP the Right Way! Pingback: Building a Business-Aware Cloud Solution « ERP the Right Way!